Image caption A GoFundMe for victims of the Humboldt Broncos bus crash has raised C$14.5M as of Wednesday evening. An online campaign to raise money for victims of a Canadian ice hockey team bus crash has become one of GoFundMe's most successful fundraisers. A bus carrying the Humboldt Broncos junior ice hockey team crashed into a lorry on 6 April, killing 16 and leaving 13 injured. The GoFundMe campaign for the victims quickly took off, and has gone on to raise more than C$15m ($12m, £8.5m). It is second only to the TimesUp campaign, which has raised $21m. The Humboldt campaign was created by Sylvie Kellington, a resident of the team's hometown of Humboldt, Saskatchewan, on the night of the crash. Since then almost 140,000 people have donated from 80 different countries. The campaign's initial goal was to raise $5,000 but it quickly took off as Canadians collectively mourned the many young lives lost or destroyed in the crash. It is believed to be the largest online fundraiser of its kind in Canadian history, and one of the largest in the world. The Las Vegas Victims' Fund campaign set a record on GoFundMe last October when it raised more than $10m in 11 days. To date 88,341 people have raised more than $11.8m. The Humboldt campaign is surpassed only by the GoFundMe page for the TimesUp Legal Defence Fund, which benefits victims of workplace sexual harassment, assault and abuse. Several Hollywood celebrities and organsiations - such as Meryl Streep, JJ Abrams and United Artists - have donated millions, which has helped it become the most successful fundraiser in GoFundMe's history. But what makes the Humboldt Broncos campaign so unique is that most of the money has come from individuals. While companies such as Canadian Tire have donated tens of thousands of dollars, thousands of ordinary Canadians have shelled out hundreds of dollars out of their own pocket. 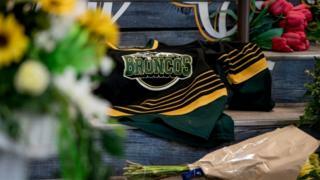 The money will go into a new non-profit called the Humboldt Broncos Memorial Fund Inc, and the charity is working with pro-bono lawyers and accountants to decide how to equitably distribute the funds. The non-profit will continue to accept donations after the GoFundMe has ended. "If there is any light shining through this dark time, it has come in the form of love for one another," Humboldt Broncos president Kevin Garinger said. "Our families and our entire organisation has been blessed to feel this love from people from around the globe. "Our priority currently remains focused, as it has since day one, on working to support our Bronco families, especially now as they are celebrating the lives of their loved ones and supporting our players who are struggling to heal."